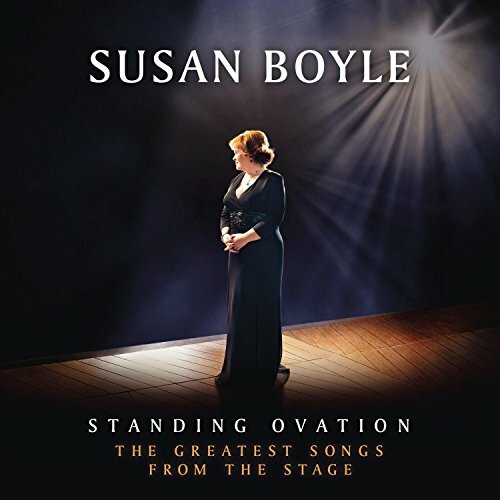 Standing Ovation sees singing sensation Susan Boyle and world acclaimed producer Biff Stannard join forces to present a stunning album of songs from the golden era of film and stage. Featuring breathtaking renditions of 'Send in the Clowns' and 'Bring Him Home', Susan fearlessly takes on the iconic song 'Somewhere Over The Rainbow' giving it a new identity. 'Standing Ovation' also showcases duets with her lifelong idol Donny Osmond and the "Phantom" himself Michael Crawford. One of the selections, "Memory" from the musical Cats, will be familiar to her fans it's the song Susan sang in the semi-final round of Britain's Got Talent in 2009. The album heralds a return to an era of much loved music for Susan Boyle, a lifelong fan of musicals. Her favorite songs from the golden age of film and theatre fused with her outstanding vocals from the ethereal to the dramatic, the music showcases the voice the world fell in love with. Talking about her album Susan said; "I have been a fan of musicals since I was a wee girl. I love them and have enjoyed the drama and the range of emotions they inspire in you. I still remember the first time I saw Les Mis, my all time favorite. I fell in love with it and have seen it now countless times as each time you watch it you draw something different. Creating this album was a joy and came very naturally as I knew the songs and could identify with the characters in the studio. Recording with Donny on two songs was a dream come true. Working with him was awesome and I learned so much from him as a performer and a person. Being in the studio with him was without doubt the best day ever- it wasn't work!" Standing Ovation was produced by Biff Stannard in Glasgow and London. Stannard is a highly regarded producer who in the past has worked with Kylie Minogue, U2, Westlife and One Direction to name a few. View More In Vocal Pop. If you have any questions about this product by Syco Music, contact us by completing and submitting the form below. If you are looking for a specif part number, please include it with your message.